What Types of Companies Are Members of HBAGP? … In short, any company that benefits from a healthy building industry! Companies become members of their professional industry association for various reasons. Here are a few of the highlights members receive from their membership investment! Instant access to valuable home building industry contacts. HBAGP Members are among the most influential and powerful companies in the local building & remodeling industry! Your voice counts! Shape the direction of the local home building industry and have a voice in governmental issues that affect your business! Use our consumer marketing events (Home Show and Parade of Homes) to promote your business to the public. Members participate at a discounted rate! Gain credibility with your customers and clients from being affiliated with your industry’s professional trade group. Builder Members - are companies actively involved in the construction of new homes, the remodeling of existing homes, or developing buildable land. 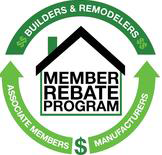 Associate Members - are companies that provide a product or service to the home building/home remodeling industry. Web Development and Hosting by Stellar Systems Inc.